If you'd rather tighten a cinch than a lug nut, you might want to consider grazing more and haying less. There is a chance your budget will even thank you. With well-planned intensive management, irrigated pasture can be more productive than the same ground used for haying. Some ranchers are looking at a change from haying to grazing those irrigated fields. Jeff Mosley, PhD (Extension Range Management Specialist, Montana State University) says that in some situations grazing makes more sense. "For example, some irrigated hayfields are irregularly shaped near creeks, and swathing them is slow and inefficient. The cut hay often takes a long time to dry in those fields before it can be baled, so regrowth is delayed while waiting to bale, and risk of getting the hay rained on increases," says Mosley. Even good hay ground can be profitably grazed instead of haying. 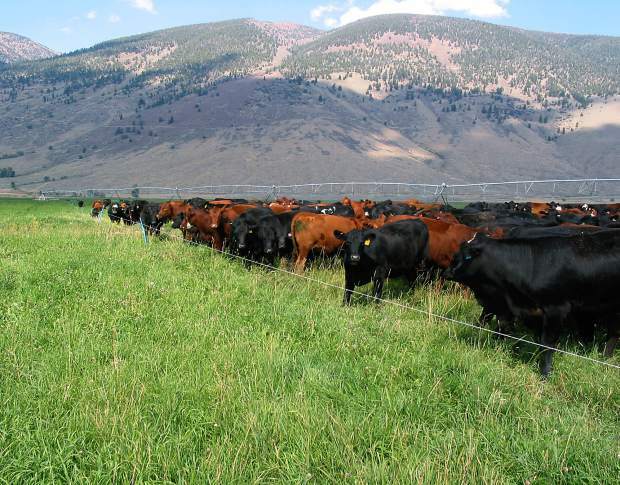 Jim Gerrish, American Grazinglands Services (May, Idaho) has been involved with innovative grazing systems for many years, and is now raising cattle in eastern central Idaho, practicing these principals on his Circle Pi Ranch. "We do daily pasture rotation with the cattle, on center pivots. Irrigated pasture has high production potential and the ability to regrow rapidly. We do a fast rotation, putting water back onto a strip a day or two after it is grazed. This accelerates regrowth and creates opportunity for creating another crop," he says. "Well-managed pasture under center pivots will meet or exceed hay production, so a person is not giving up any productivity by grazing it instead of haying. You have more days of active growth," says Gerrish. It only grows up once for hay (or twice if you have a long growing season) but you have multiple cropping with grazing. Gerrish said he grazes most of his pastures four times each season. On average he gets 40 to 50 percent higher dry matter production harvesting with hooved creatures than with wheeled machinery. His pastures are strip grazed under the pivots. If irrigation depends on a creek that has less water in late summer, and the ditch was turned off to dry out the field enough to harvest the hay, there may not be enough water later to get the ground wet again for fall regrowth, and production is lost. "Grazing is often appealing because fuel costs are less than for haying, but producers need to consider that switching from haying to grazing may require additional investments in fencing or water developments. Even if stock water is present, volume may be inadequate to meet demands of high stock densities needed to properly manage irrigated pasture. Additional fencing may be needed to avoid negative impacts to riparian areas when hay ground adjacent to creeks is converted to irrigated pasture," he says. "When producers switch from haying to grazing I don't recommend they increase stocking rate at first, until they see how it goes. In general, the tonnage harvested by proper grazing management of irrigated pasture is about the same as the tonnage harvested by proper hay production on irrigated hay land. Sometimes the tonnage goes up with grazing, but it can also go down, since individual producers are often better at either managing grazing or managing haying," Mosley explains. Randy Wiedmeier, University of Missouri Extension, spent 25 years at Utah State University at Logan, working with range and forage projects. "I was born in Utah but raised in Montana, so I am familiar with the arid western states. While I was at Utah State, we were trying to address some of the problems ranchers are having with public lands. We looked at ways they could extend their private grazing as an alternative when facing curtailments on grazing permits," he says. "We looked at maximizing irrigated pastures, first to determine which grasses would work best in our Great Basin and Rocky Mountain areas. We also did some work on winter grazing and were able to maintain a cow-calf pair on about one acre each year, with year-round grazing," says Wiedmeier. Cattle grazing tests—not just the clip tests helped measure production. Wiedmeier said they tried out perennial ryegrass, an orchard grass, a meadow brome, and a couple of endophyte-free fescue varieties. "We evaluated all aspects, including ease of establishment, productivity of the grass and its ability to withstand management intensive grazing. Fescue came out the most desirable, by far. It's not the most palatable grass and cattle will select something else if there's other grass available, but they will eat it. 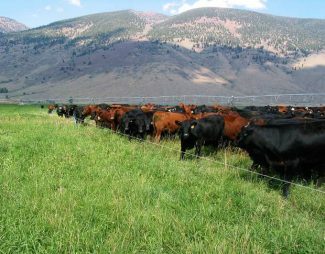 We were able to harvest about 12,000 pounds of dry matter per acre for a 180-day grazing period in the Cache Valley in Utah, with the tall fescues." Fescue is a hardy, productive grass and this is why much of the cow-calf industry in the U.S. utilizes it. "We could graze a cow-calf pair (allowing 46 pounds of dry matter intake per cow-calf pair per day), on 1.9 acres for 180 days. This is using management intensive grazing, moving the cattle every day, utilizing poly wire temporary fencing. The cattle were on and off the paddocks very quickly." Wiedmeier acknowledges that some producers won't want to move cattle daily but said intensive rotation will increase carrying capacity by 40 to 50 percent compared with other systems. "With an intensive system like this, we could easily wean a 700-pound calf in 220 days." Calves raised on irrigated pasture are always heavier than calves raised on dry rangeland, partly because their mothers milk better. Grazing can be more profitable than putting up hay on that same land. It may also be a feasible option if a person's public grazing is eliminated or reduced and you have to run the cattle at home on your hayfields instead of putting up hay. "It's the same situation all over the West. We never know from one administration to the next what will happen, or whether the ranchers will be able to continue to use the range—or if the agencies will make it so difficult to use it that some ranchers quit." If a person can put up seven tons per acre per year at $200 per ton for good alfalfa hay, this would be $1,400 per acre before you deduct the costs of irrigation, machinery, and all the other costs involved in making hay. "By the time you take at least $600 an acre off that for growing and putting up the hay, you might make $800 an acre," Wiedmeier says. If a person has to replace older machinery, this expense would take a big chunk out of the profit for haying. There will be less profit on grass hay, which is worth less per ton, and which might make only one cutting per season (in Western climates) instead of three. "By contrast, with a cow-calf production system you might be looking at $1,000 per acre return, with today's cattle prices," he says. "I was raised in an area in Montana where we put up hay all summer and fed hay all winter, sometimes from October through May. Putting up hay is always risky, with the weather. It costs just as much to put up mediocre hay as good quality hay. Pasturing takes the risks out of this equation," says Wiedmeier.